The weather in East Yorkshire is very up and down at the moment – not so many sunny ‘up’ days, but lots of grey rainy ones, so Autumnal Recipes – Part Three is here to give us some more comforting recipes. Having finished my Chemotherapy a few weeks ago, I am thrilled to find my appetite returning – not completely, and strangely for me, at the moment, my savoury tastebuds are stronger than my sweeter ones. But now Radiotherapy is looming on the horizon, so heaven only knows what will happen to my appetite! Hopefully it will return fully to normal before long. As you know, I’m a very early riser. I usually sit here in my little upstairs office/spare bedroom, in my fluffy, warm pink dressing gown, and if it very cold, I pull the hood up looking, I should imagine, a bit like a demented monk, with about half a centimeter of fluffy white/blonde hair. For some reason the hair on my left side is thicker and more even than the right side – work that out someone! When I look in my mirror at the moment, it looks a bit like a fluffy halo – but not at all saintly or angelic. This morning it is still very black out there, so a bit of comfort food is called for. One of my favourite food sites at the moment is the Great British Chefs site. It has recipes for everyone, whether you are a Michelin star chef or just a home cook. Lots of ideas, some are fine-dining but many are recipes that most of us could manage in our domestic kitchens. So in Autumnal Recipes – Part Three I give you a very comforting recipe, Toad in the Hole. Wow! Don’t you just want a big plateful of this right now? I do. Autumnal Recipes – Part Three. Toad in the Hole – courtesy Galton Blackiston for Great British Chefs. 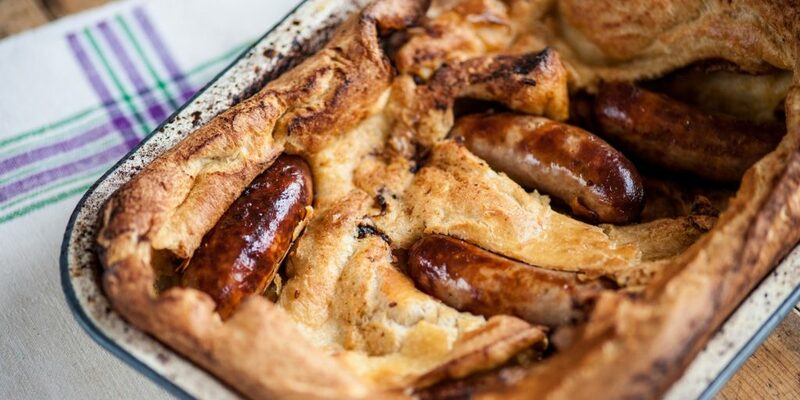 This Toad in the Hole recipe is by Galton Blackiston, courtesy of Great British Chefs. Galton has held his Michelin star since 1999. Although it says below that the Prep Time is 10 mins, don't forget you have to leave the batter for about an hour in the fridge before cooking. Most people in the UK love Toad in the Hole, basically sausages in a Yorkshire Pudding batter, roasted in the oven. Just take care that when in the oven the dish doesn't burn. The batter needs the heat at the beginning to help it rise and fluff up, but because it's center has to cook well, as time goes on, keep looking and if the top starts to look quite well done, turn the oven down gently, once or twice. The top of the batter needs to be golden brown and crisp. Make the batter well in advance. Sieve the flour, salt, pepper, sugar and grated nutmeg in a bowl. Make a well in the center and break in the three eggs. Use a hand held whisk to slowly incorporate the eggs and then, while continuing to whisk, slowly add in the milk until the batter has the consistency of double cream. Whisk thoroughly to ensure there are no lumps of flour in the mixture. Place in the fridge for at least one hour. Preheat your oven to 200C/220 fan/gas mark 6. Place a roasting tin in the oven until scorching hot. Then add the duck fat and sausages to the hot tin and return to the oven. Shake at regular intervals until the sausages are coloured all over and the fat is very hot and spitting (about 10-15 minutes). Remove the batter from the fridge and give it a quick whisk. Once the sausages are evenly coloured, remove the tray from the oven and immediately pour the batter over the hot sausages - the batter should start to sizzle. Return to the oven immediately and cook for 30-40 minutes, or until the batter is well risen and golden. Serve immediately, with your chosen accompaniments. Especially good with this is Onion Gravy and a simple green vegetable such as steamed or stir-fried Cavolo Nero Kale or Broccoli. I chose this Toad in the Hole recipe because it just looked so good, then realised that it was by Michelin star chef, Galton Blackiston. Galton has a beautiful country house hotel and restaurant, Morston Hall, in Norfolk, and has held his Michelin star since 1999. Co-incidentally, my Designer son, Anthony Hodgson of Face Publications, has designed Galton’s latest book, “Hook Line Sinker”, a brilliant book based on Galton’s favourite fish recipes. I am a lucky mum, as Anthony always sends me copies of the new cookbooks designed by him, and this new one is stunning. Beautiful to look at, with mouthwatering fish and shellfish recipes that have really helped to wake up my tastebuds. Galton’s recipe is brilliant, but there are so many versions of Toad in the Hole. To make it a bit more substantial, wrap bacon rashers around your sausages, or even add red onion wedges in when you add the sausages. To add even more flavour, add a good sprinkling of your favourite herbs into your batter – Thyme leaves, Chopped Rosemary or Sage would give real flavour. And you could even add a decent dollop of either wholegrain or Dijon mustard into the mix. The choice is endless. I like to give my batter a good pinch of salt and quite a bit of freshly ground spicy Black Pepper. Now, I’ve just realised that in Autumnal Recipes – Part Three it would be very remiss of me to give you Galton’s recipe for Toad in the Hole but not give you the recipe for Onion Gravy. This recipe is for Caramelised Onion Gravy, and is from Good Food magazine. This Caramelised Onion Gravy recipe is brilliant with Toad in the Hole or Sausage and Mash. The onions can be prepped and cooked until they are up to the 'slightly sticky' phase. To finish, warm the onions gently and continue to finish the gravy (see below). Drizzle a little oil into a saucepan. Add the sliced onions ad cook slowly for 15 mins. Stir every now and then until they are soft and caramelised. Add the sugar and balsamic vinegar and cook for 5 mins more, until slightly sticky. To finish the gravy, stir the flour into the onions to make a paste, cooking for 1 - 2 minutes. Continue stirring while you splash in the wine, a little at a time, until you have a smooth, thick sauce. Increase the heat and bubble for a few mins until reduced by half. Add the stock and some seasoning and continue bubbling for 10 mins. Depending on when the Toad in the Hole will be ready, either turn the gravy down very low, or turn off and re-heat just before serving. How time flies. Time to go and wake up Erik, and begin our day properly. After spending these early hours writing Autumnal Recipes – Part Three, about Toad in the Hole and Caramelised Onion Gravy, I am now ravenous. I think I will nip to the shops and make it my turn to create this comforting meal for tonight. No. Not tonight – it’s Strictly, one of my favourite programmes. Erik always cooks on Saturdays when Strictly is on. So, Sunday Tea it is. Toad in the Hole, Caramelised Onion Gravy and some fantastic Kale, with butter and a hint of Chilli to give it a kick. Who’s coming round?